"1 photograph; 21.5 x 27.8 cm. 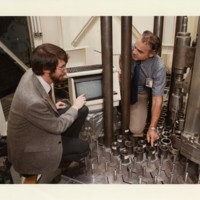 Both men pointing, one pointing at computer and another at a cylinder object with a metal pipe. 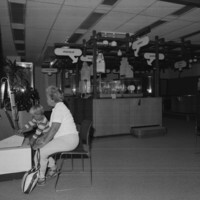 Text on back of image reads: ""Photo No. 8500196 - 9CN PNL Photography Richland, Washington 99352""." 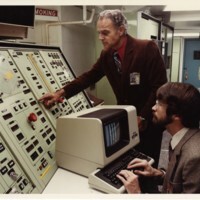 One man pointing to machine part with another man looking at it while on a computer. Photo No. 8500197 - 3-CN; PNL Photography Richland, Washington 99352." "1 photograph; 12.8 x 17.3 cm. 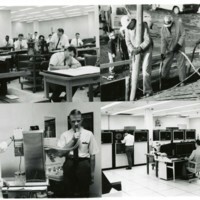 Men working on drafts, men working with tubes, woman and man with medical equipment, two men working on machines."